Leading Manufacturer and Exporter from Jaipur, our product range includes Basins and Bath Accessories such as Antique Rainbow Gold Basin, Freestanding Stone Basin and White Stone Basin. 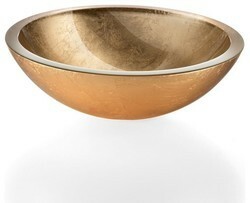 Being one of the prominent organizations, we are involved in offering a wide range of Antique Rainbow Gold Basin. These are admired for their lightweight and appealing look. Following the precise demands of clients, we offer these in various designs, styles and color combinations. Our basins are acclaimed for their crack resistance, designer appearance and fine finish.